Today I reached into my inner “rocker chic” style and pulled off this motorcycle type look. I absolutely love these thigh boots I just got from Torrid. Ladies if you have thick thighs then these are the boots for you. They have a 19 inch circumference around the leg so my plus-size ladies are in luck. I had so many people to stop me and ask where did I find them. 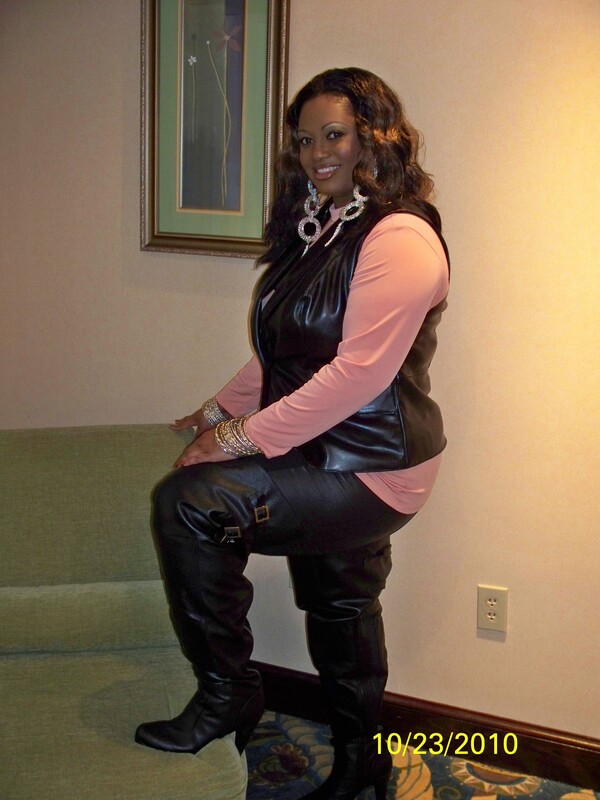 I paired them with the faux-leather panel leggings also from Torrid. These leggings are stylish and comfy. (But order a couple of sizes larger in the leggings though. I normally wear a size 2X but had to get them in a size 4X ). The faux leather vest is from Lane Bryant’s clearance sale from last year so I’m not quite sure the exact price I paid for it but I know it wasn’t much. I don’t usually do much shopping from Lane Bryant, being that I don’t have a store near me, but I thought this was a really stylish piece from them. My peek-a-boo top is from Ashley Stewart from about two years ago. Thank you for the heads up!! For the first time in my LIFE I ordered a pair of boots and they FIT! I got the Ashley boots from Torrid O-M-G!! !